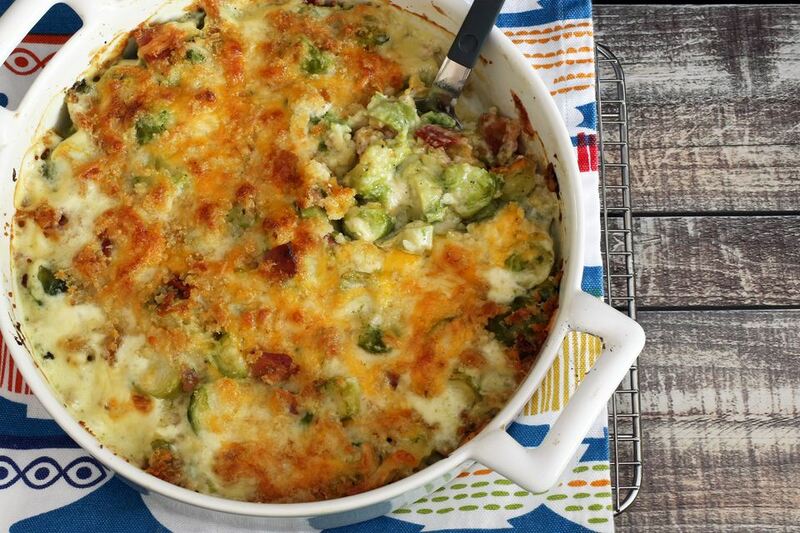 This simple gratin of Brussels sprouts and bacon is made with only six ingredients plus salt and pepper, and you can easily make it low carb by eliminating the bread crumb topping. The Brussels sprouts are cooked and then baked with bacon, butter, cream, and an amazing bread crumb and cheddar topping. We used 3 strips of bacon in the gratin, but feel free to omit the bacon or use more, depending on your tastes. Sliced sauteed mushrooms would make a delicious addition to the dish as well. Trim the stems of the Brussels sprouts, and removed damage and loose outer leaves. Rinse well. Put the trimmed Brussels sprouts in a medium saucepan, and cover with water. Add about 2 teaspoons of kosher salt to the water, and bring to a boil. Cover the pan, reduce the heat to medium-low, and cook for about 8 minutes, or until the sprouts are tender. Drain in a colander, and let the sprouts cool. In a large skillet over medium heat, cook the bacon until almost crisp. Remove to paper towels to drain. Dice or crumble the bacon. Heat the oven to 400 F. Butter a 2-quart baking dish. When the sprouts are cool enough to handle, chop them coarsely, and transfer them to the prepared baking dish. Sprinkle the Brussels sprouts lightly with kosher salt and freshly ground black pepper, to taste. Add 2 tablespoons of the melted butter, and toss to coat. Pour the cream evenly over the sprouts. Combine the bread crumbs with the remaining 2 tablespoons of melted butter. Mix with a fork until thoroughly blended. Add the shredded cheese to the crumbs, and toss to blend. Sprinkle the bread crumb and cheese mixture over the Brussels sprouts. Bake the casserole in the preheated oven for about 15 to 20 minutes, or until the topping is deep golden brown. Choose fresh whole stalks of sprouts if they're available. Brussels sprouts heads should be tight, firm, and bright green. Avoid sprouts that are yellowed or not tightly closed. Omit the bacon for a vegetarian version, or use vegetarian bacon. Replace the bacon with diced sauteed pancetta or ham. Add sliced sauteed mushrooms to the casserole. Instead of cheddar cheese, choose something different. Swiss cheese, Gruyere, or fontina are all good choices. Or use a combination of a few kinds of cheese. A cheddar and mozzarella blend would make an excellent topping.